Reading and share top 19 famous quotes and sayings about Warm Weather by famous authors and people. Browse top 19 famous quotes and sayings about Warm Weather by most favorite authors. 1. "It's warmed up a bit," Shukhov decided. "Eighteen below, no more. Good weather for bricklaying." 2. "I'm not into cold weather, I like warm weather." 3. "I work out four days a week in the off-season, and in the warm, running weather months, I do five days. A push/pull regime of weightlifting, cycling, and the occasional Saturday or Sunday run with my oldest son, even if it's cold out." 4. "At least, not in this country,' she added after a moment's thought. 'In China it's a little different. Once I saw a Chinaman in Shanghai. His ears were so big he could use them for a raincoat. When it rained, he just crept in under his ears and was warm and snug as could be. Not that the ears had such a rattling good time of it, you understand. If it was specially bad weather, he'd invite friends and acquaintances to pitch camp under his ears too. There they sat, singing their sorrowful songs while it poured down outside." 5. "I've been producing documentaries on global warming for 20 years and have seen the early warnings of extreme weather events come true." 6. "I'd heard theories. Destruction of forests had altered pressure zones. Global warming made for stronger storms. Chemtrails indicated government manipulation of the weather. God punished the family and neighbors of idolaters." 7. "External heat and cold had little influence on Scrooge. No warmth could warm, no wintry weather chill him. No wind that blew was bitterer than he, no falling snow was more intent upon its purpose, no pelting rain less open to entreaty." 8. "The Chicago Sun-Times is a national leader in two areas: 1) Denying that racial mob violence exists, and 2) Explaining why it does. When a mob of five hundred people stormed through downtown Chicago, beating and threatening and destroying property, do you know what the excuse was?1) Warm weather"
9. "I like summer. I like warmer weather and long days. I'm one of those silly people who still enjoy lying in the sun - my children are horrified!" 10. "Although he was a young and virile man at 37, he was not inexhaustible. In addition to food and drink, he had better lay in a couple thousand tablets of viagra. The drug would probably remain potent if he vacuum packed the pills in groups of 10 and kept them in a freezer. That would work unless civilization completely collapsed and power companies were unable to function. Fortunately, Jim had a propane-powered backup generator with half a dozen tanks of fuel already on hand. If Henry added to the propane supply, and he used the generator only for essential maintenance like keeping the viagra freezer operating in warm weather, he would be happy here on the farm for a looong, looong time. Unless, even now, dead Jim was out there in the generator shed sabotaging the machinery." 11. 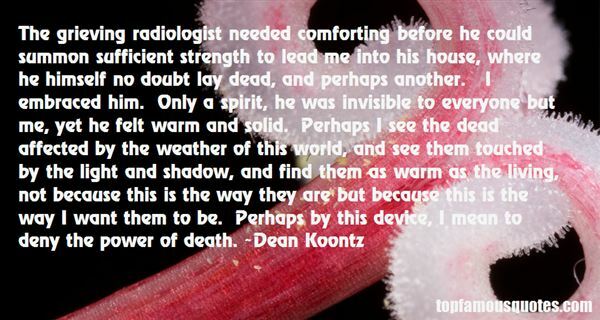 "The grieving radiologist needed comforting before he could summon sufficient strength to lead me into his house, where he himself no doubt lay dead, and perhaps another. I embraced him. Only a spirit, he was invisible to everyone but me, yet he felt warm and solid. Perhaps I see the dead affected by the weather of this world, and see them touched by the light and shadow, and find them as warm as the living, not because this is the way they are but because this is the way I want them to be. Perhaps by this device, I mean to deny the power of death." 12. "The time of dangling insects arrived. White houses with caterpillars dangling from the eaves. White stones in driveways. You can walk at night down the middle of the street and hear women talking on the telephone. Warmer weather produces voices in the dark. They are talking about their adolescent sons. How big, how fast. The sons are almost frightening. The quantities they eat. The way they loom in doorways. These are the days that are full of wormy bugs. They are in the grass, stuck to the siding, hanging in the hair, hanging from the trees and eaves, stuck to the window screens. The women talk long-distance to grandparents of growing boys. They share the Trimline phone, beamish old folks in hand-knit sweaters on fixed incomes. What happens to them when the commercial ends?" 13. "I began to mourn the simplicity of my childhood, the warmth of my family that now seemed lost, years had passed by and we had all been weathered by the world. At times all I could see in their eyes was the reflection of loneliness in the longing we had for each other but there was always that glint of bitterness because they never really forgive you for leaving them do they?" 14. "The ordinary reality, as I perceive it, is but a huge and intricate virtual screen which operates on multiple levels. Its origins and developments extend far beyond the understanding and scope of the established functioning of the mind. Trapped in the pen of the binary system and the identification with their physical bodies, human beings eat up a fodder made up of sin, guilt and fear, as they watch the soap opera of life being repeated over and over. Yet such a mirage is so insane and unreal that attentive eyes cannot help discovering gaps all over the place. Although the operators at the projector do their best to botch it up, the absurd illusion of this misperception may reveal itself at any moment. It is like a boasting block of ice showing off its solidity as long as the temperature is below zero and yet inevitably starting to thaw and melt away in warmer weather." 15. "Our planet is warming due to pollution from human activities. 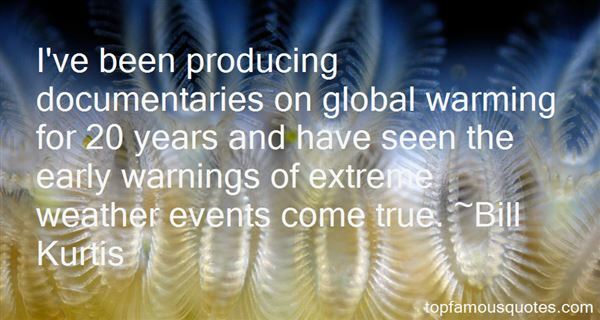 And a warming climate increases the likelihood of extreme weather." 16. "What did a person need to survive? Food. Water. Shelter. Warmth in cold weather. And something else... books." 17. "How little we have, I thought, between us and the waiting cold, the mystery, death--a strip of beach, a hill, a few walls of wood or stone, a little fire--and tomorrow's sun, rising and warming us, tomorrow's hope of peace and better weather . . . What if tomorrow vanished in the storm? What if time stood still? And yesterday--if once we lost our way, blundered in the storm--would we find yesterday again ahead of us, where we had thought tomorrow's sun would rise?" 18. "If I were you, Mr Lascelles," said Childermass, softly, "I would speak more guardedly. You are in the north now. In John Uskglass's own country. Our towns and cities and abbeys were built by him. Our laws were made by him. He is in our minds and hearts andspeech. Were it summer you would see a carpet of tiny flowers beneath every hedgerow, of a bluish-white colour. We call them John's Farthings. When the weather is contrary and we have warm weather in winter or it rains in summer the country people say that JohnUskglass is in love again and neglects his business. 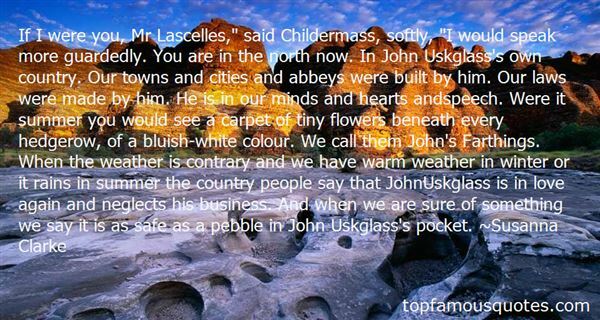 And when we are sure of something we say it is as safe as a pebble in John Uskglass's pocket." 19. "It was a spring day, the sort that gives people hope: all soft winds and delicate smells ofwarm earth. Suicide weather." People can love their lies, tell their lies, believe their own lies until hell pays a visit."